Cook rice according to package directions. Heat vinegar, sherry, sugar, and lemon rind in small saucepan over medium heat until sugar is melted, about 1 minute. Drizzle vinegar mixture over rice and toss. While rice is cooking, cook nuts in sesame oil in small skillet over medium heat until toasted, about 2 minutes; remove from skillet. Add snow peas, ginger, and water to skillet; cook, covered, over medium heat until snow peas are crisp-tender, about 2 to 3 minutes. Stir nuts, snow peas, ginger root, beans, cucumber, orange and green onions into rice. Season with salt and pepper. Cooked bean-rice mixture can be served or rolled when warm or chilled. 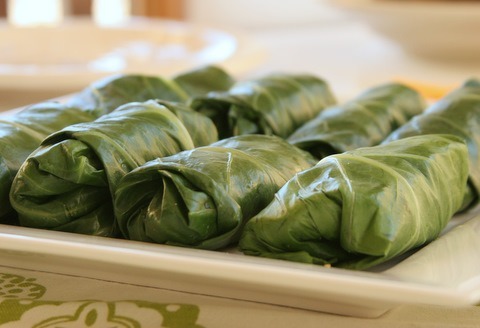 When ready to make rolls, spoon about ¼ cup packed rice mixture onto each lettuce leaf and roll up.